Clear communication and easy to book! Very prompt with communication via email. Emails were detailed and specific, which made navigating the entire process seamless. Emails that were received at the beginning of the booking, a week prior to arrival, and follow-up emails after our vacation ended, all made the experience great. Ample parking, parking under a covered area/garage, ease of access to pedestrian crosswalk for beach accessibility, the playroom for the children that was located on the middle floor, plenty of showers and bed space for a large number of family. Had a good experience with all in the office. Liked everything about the property but don't like side by side refrigerators. Don't think they hold as much. And, we cook when we are at the beach! Takes a while for the ice maker to work and we usually have to purchase more ice. Other than that, we love everything about the property! Multiple family members stated that this was the best house we have ever stayed at (and weve been going to Carolina Beach for a long time!). They house fit my family size wonderfully. It was a great location and only a short walk from to the beach. Quick response to any questions I had! Perfect view! Very clean and stocked well. I had a wonderful experience with A1 property management. Anytime we called (about ordering sheets before we arrived and during our stay because of a broken appliance) someone always called us back immediately to help. Moreover, they sent someone right over to deliver a working microwave since it would not have been possible to reinstall a microwave during our stay. This was during a busy holiday week as well so we really appreciated the quick response time. The view of the condo was perfect. We wanted something right on the beach and this condo and deck delivered! The house was clean when we arrived and in great shape. The condo itself was great, very clean, decorated nicely and had everything that was advertised it would have. Nice & big deck. Lots of room for our family to enjoy. It was a pleasure to rent our vacation through A1 Property management! The process was very simple and quick. I had only one question throughout our booking and our stay and it was answered quickly and without issue. Our unit at Reefs VI, unit 2B, was lovely. The decor was nice, bedding was comfortable (even the pull-out sofa) and the kitchen was adequately stocked. It was nice to have the ground level closet for our beach items and not have to take them back to our room. 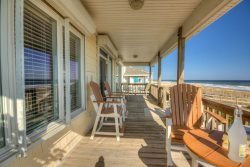 The location is excellent - far enough away from the busy boardwalk area, yet close enough to walk to it and restaurants. Any questions were answered probably within just hours. I appreciated how organized they were including their instructions and info sheet on the fridge. It made the rental aspect pretty darn simple. Wonderful location, view, and decor. As soon as we walked in, it felt like home. We were never far from the deck either being outside on the different seating options or enjoying the view from the living room. Everyone was very easy to work with! Responded quickly to my emails. Property was beautiful! Great location with ocean views and it was extremely clean and well taken care of. Not too crowded. Pool and beach easily accessible. Dealing with A1 is very easy. We love working with the A1property team, very professional and attentive to every need. Your team is the best and we would not consider using anyone else. We really love the Beachy Keen property. The rental process was easy and efficient! The house was beautiful, had a great location and we all loved the outside shower and porch! Just a great house overall! Very clean, always a plus. Ease of check in and check out procedure. Very positive experience. During our stay we were missing an iron (or so we thought) and I sent an email asking if I could come by the office the following day and borrow one. Within an hour David knocked on our door and delivered an iron. Unexpected, but appreciated. Check-in and check-out processes were quick and easy. Very clean and well maintained. Right on the beach. I only had email contact, but that was because all communication went so smoothly...there was no need for phone calls. All my questions were answered promptly and the rental agreement and payments were all handled online without a hitch. Even without personal contact, I can tell that you are a great team! Definitely location! There's nothing like waking up to to the sound of the ocean! Also, the home was comfortable and beautifully decorated and very quiet and peaceful. So easy to book the property and plan for the trip. Seamless! Excellent location with great views. Very clean and comfortable condo. Everything we could have possibly needed was provided, plus several extra touches that made us feel very welcome.